Recently I watched the ITV drama Lost in Austen for a second time. 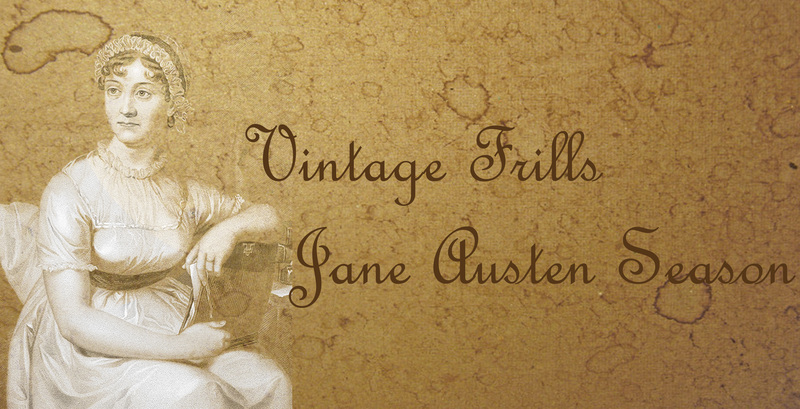 Spread across 4 hour-long episodes this is a treat for any Austen fan. 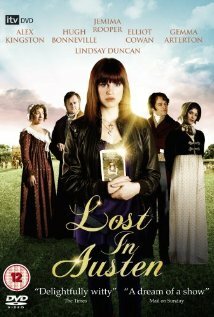 Lost in Austen is a modern drama in which the main character Amanda Price – a Pride and Prejudice obsessive, finds herself living within the novel having switched places with Elizabeth Bennet. What makes this programme so good is the vast attention to detail. It could have been done very badly but instead every aspect of the book has been studied as well as taking into account regency etiquette. 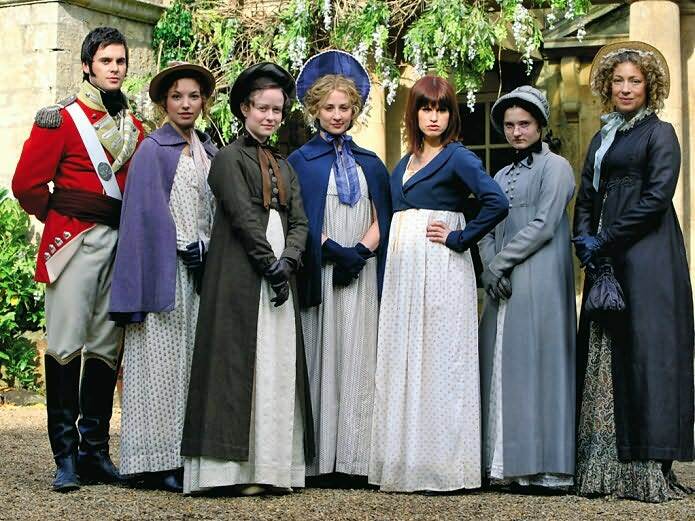 All the characters in the book stay true to Austen’s descriptions and the writers manage to develop the characters while still keeping true to the feel of the original book. Many may not agree as many things are dramatically changed, but I think it is done in a funny, natural and realistic way. I love the character of Amanda Price who loves the manners of regency England and yet thrown into Elizabeth Bennet’s world she struggles to fit in. She is outspoken and very funny. Everything seems to go wrong as Amanda desperately tries to make the story happen as it did in the book and everything can’t help falling apart. It tells like a ‘what if’ story in which an alternative version of Austen’s book is played out. The costumes and sets are perfect and I love the choice of Biggin House in Yorkshire for Longbourne, it fits with the kind of house that the Bennet’s would be living in as opposed to the ramshackle setting in the 2005 Pride and Prejudice film. And Harewood House, also in Yorkshire makes a perfect Pemberley. Without giving too much away I’d recommend this as a bit of fun for die-hard Austen fans, especially those who fantasize about Mr Darcy! Elliot Cowan is fabulous as Mr Darcy in a performance that makes him a close contender to Collin Firth. I think what I liked most was the portrayal of Mr and Mrs Bennet. Every time I have read pride and Prejudice or seen a film I feel Mr Bennet is treated with too much sympathy. In this you get more of a sence that he has a cold side which does not care if his wife and children are left homeless after his death. He comes across as a man who married the wrong women and has hidden behind his books ever since, he is almost too cowardly to face up to the reality that his five daughters have a fragile fate ahead of them. Mrs Bennet is shown as a woman who has to be strong to protect her daughters futures, but is also emotional foolish and silly. It would have been so important for the daughters to marry given that Mr Collins would inherit Longbourne, and Mrs Bennet is not at all foolish for seeking good marriages for them. In conclusion I really do love this programme, it is fun, silly and full of beautiful regency language and costumes, what more could you want?! If you haven’t watched Lost in Austen yet please do and let me know what you think. I’ve been to Harewood House! 😀 I loved LIA. I found Darcy rather irritating though, I much preferred Wickham. 😛 I agree– it was very well done. Yes Wickham was a fantastic character in this, loved the alternative perspective of him. Harewood House is now on my list of places to see! Yes, beforehand I loathed him, but now I think he is one of my favourite characters. 😀 It’s lovely. Blenheim Palace is wonderful, have you been there? I haven’t although I’d love to. I don’t stray beyond London and Surrey very often! Keep trying to persuade my husband to do a British road trip for our next holiday, as some of the best historic houses are no where near us!